You are invited to the Celebrate Recovery Evening of Christmas Music on December 21 at the West Linn Campus in the basement Fellowship Hall. Bring your friends, family, and kids, and be prepared to celebrate your recovery AND the birth of our Lord and Savior, Jesus Christ. You don’t have to have Hurts, Habits or Hang-ups to attend! ReGeneration will meet this Sunday night, December 16, at 7 p.m. in the Upper Fireside Room at the West Linn Campus. We will celebrate the Gospel, pursue Jesus, eat dinner, and develop a community of young adults. 2nd Wednesday Luncheon - Please join us on Wednesday, December 12 at 12:30 p.m. downstairs at the West Linn Campus for the monthly 2nd Wednesday Luncheon. Please bring a dish to share. Bruce Tissell will be our guest speaker and tell us about his ministry in Brazil. Sunday, December 23 we will have two worship services, at 9 and 10:45 a.m. Childcare will be provided for children under age 3 during the 9 a.m. service. Christmas Eve - On Christmas Eve we will have services at 4 p.m. and 5:30 p.m. in West Linn, and 5 p.m. in Wilsonville. Please pick up an invitation in the lobby and invite your friends and family. Memorial Service for Colleen Mickelson - Join us on December 16 at 2 p.m. at the West Linn Campus as we remember Colleen. Make Year-End Gifts on the Church Website - In the course of year-end tax planning, you may find yourself considering special one-time donations. Online credit card donations made through the church website will only count as 2018 donations if your credit card is charged by December 31, 2018. This can take up to four business days from the day that you make your donation online. Stay-Up-To-Date - Text @newlifenw to 81010 for inclement weather updates, last minute notifications, and encouraging reminders by text message. 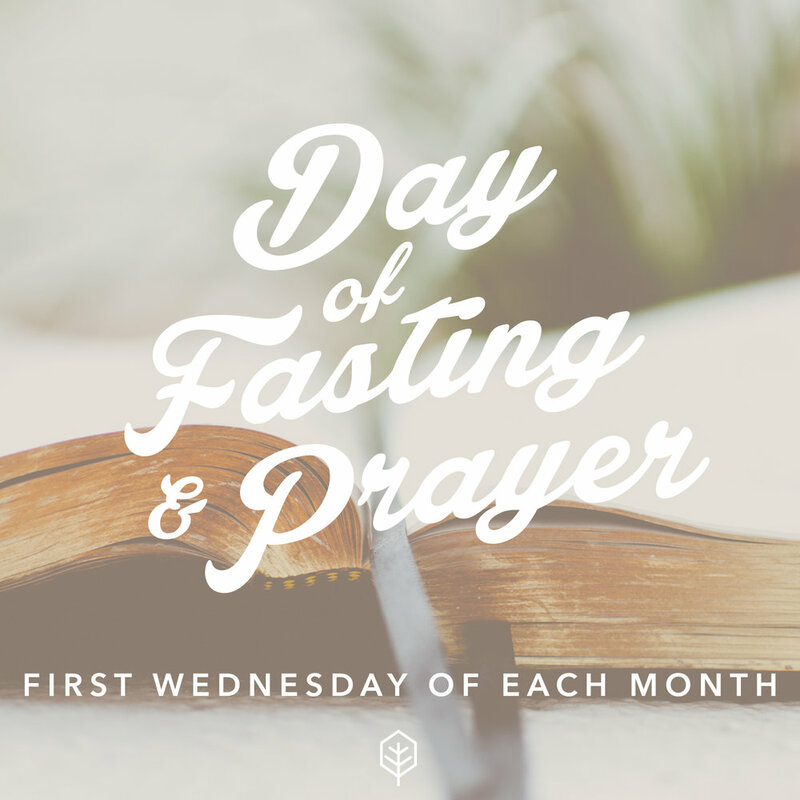 Today is the first Wednesday of the month, the day that we designate as a day of prayer and fasting. If ever we needed to call out to the Lord for help, it’s now. Not only do we have unswerving confidence that he welcomes us, he hears us, and he stands ready to help – we have a great need. What God has done this past month since our last day of prayer has been absolutely breathtaking. It is so obvious that the work has been accomplished by him and not by us that it gives me great confidence to ask again. As you probably know, Canby First Baptist Church chose not to join us in planting a church in Canby. That means we are back to the drawing board on what the next steps might be. We are reassessing the opportunity to plant a church in Canby. Please pray that God would make the direction clear and the way straight for the next New Life Church plant. In addition, we have been approached by an experienced church planter (he’s planted five churches already). His salary is being paid for two years by another church we know and trust. He approached us to see if he could plant a Hispanic church for New Life Church in our Wilsonville building. Who gets a request like that? Again, please pray that we will discern the Lord’s will and that he will make the way straight. There is every reason to be excited about this! You might think I’m avoiding perhaps the clearest and most impressive work of God in this past month. You may be aware that God has brought forty or so people to New Life Church as they exit a cult. Over thirty have been baptized in the past two months. Please pray that we will love and serve them well. Pray they will quickly feel part of the church. And pray that God would be pleased to draw many more away from their former experience. Other than that, there is just the usual...(Nope, wrong again!) We are planning to go to two services in West Linn after the first of the year. Please pray that we will do that well and that the church would be blessed by this change. There are, too, the normal things in church life that concern us all. We have many who have a serious physical needs. Please pray that God would heal them. Please pray for marriages New Life Church to be strong and filled with love and hope. Please pray we will all stand strong in faith! Oh, I almost forgot. We are still waiting on the sale of our Robinwood building. Please pray that the buyer would be approved by the city of West Linn quickly and that we will finalize the sale soon. This is the strangest prayer letter I've ever written. God is clearly at work here. Thank you for joining us in asking for more! We are grateful for the unity we share at New Life Church. At our meetings on Sunday, the budget for 2019 passed 87-1, and Andy Veitch and Josh Knopp were affirmed unanimously as elders. Thank you! The season of Advent is a time of anticipation and preparation … culminating with Christmas. The term literally means “the approach” or “the arrival.” Jesus instructs His followers to “Watch. Stay awake. Get ready and prepare!” At each of December’s worship services, various members of our church family will lead us in preparing our hearts to receive the Christ–child. We will focus on Jesus as the fulfillment of God’s PROMISE … Jesus as the LIGHT of the world … Jesus as the fullest expression of God’s LOVE for the world … and Jesus as our HOPE. The Advent Project - Biola University produces this daily, content–rich, media–filled resource incorporating devotionals, artwork, music and videos. Begins Sunday, December 2 and continues through Sunday, January 6. Good News of Great Joy - These daily devotionals can be emailed to you, or downloaded as a printable document, or you can listen to each devotional. Family Advent Guide - This printable document including devotions, activities, and discussion questions that will help us celebrate the birth of Jesus with our children, grandchildren and great-grandchildren! #IsaiahChristmas - A reading plan that leads us through the book of Isaiah until Christmas. You are invited to a baptism on Sunday, December 2 at 3 p.m. at 565 Edgewater Road, Gladstone. Day of Prayer and Fasting - Please join us in a day of prayer and fasting on Wednesday, December 5. Look for prayer requests on the church blog or in the newsletter. Stay Up-to-Date - Text @newlifenw to 81010 for inclement weather updates, last minute notifications, and encouraging reminders by text message. Share the Joy - Ladies, our Christmas celebration, will be Sunday, December 2, 5-8 p.m. at New Life Church. Bring a friend and let's pause to wonder at the Advent of Jesus Christ together. Our Next Women's Ministry 1st Thursday CONNECT will be held December 6, 6:30-8:30 p.m. It's pizza and pajamas night, so dress comfy! We will be making blankets and learning from the book of Mark. One-to-One Bible Reading for December will be the book of Luke. More information can be found on the church website. Please join us for a Shared Meal after the worship service next Sunday, December 2. Please bring a main dish and a side dish (salad, fruit, dessert, etc.) to share with others. Your generous contributions allow us to be hospitable to guests who may wish to join us. This is a great time to connect and reconnect with one another. We will have two worship gatherings on December 9, at 9 and 10:45 a.m. Treasureland, Junior High, and Senior High classes will meet at 9 a.m. One adult Bible study will meet during each service. Annual Budget and Elections Meeting - Please join us on December 2 at 11:30 a.m. for the Annual Budget and Elections Meeting. At the meeting we will introduce new members and vote on our 2019 budget. Copies of the proposed budget are available in the church foyer. Annual Budget and Elections Meeting - Please join us on December 2 at 12:30 p.m., after the Shared Meal, for the Annual Budget and Elections Meeting. At the meeting we will introduce new members, vote on our 2019 budget, and approve new elders. Copies of the proposed budget and lists of elder nominees are in the church lobby. Women's Gathering - Join us at New Life Wilsonville on December 6 at 6:30 for an evening of fellowship and food while we discuss an exciting new Women’s Ministry opportunity. Operation Christmas Child shoeboxes are due back no later than Sunday, November 18! Foster Parents Night Out Training - There will be a training at New Life Wilsonville from 6-9 p.m. on Friday, November 30. This is a one time training. If you think that you may ever volunteer to help, please consider attending. Contact Elizabeth Doris for more information. This Sunday, November 11, we will have two worship gatherings at 9:00 and 10:45 a.m. Treasureland, Junior High, and Senior High classes will meet at 9:00 a.m. One adult Bible study will meet during each service. Senior Adult Ministry Luncheon - Please join us on Wednesday, November 14, at 12:30 p.m. downstairs at the West Linn Campus for the monthly Senior Adult Luncheon. Men's Reboot, an overnight men’s retreat, starts Friday, November 16, at 6 p.m. at the Canby Grove Conference Center. Please register and pay online (before noon on Tuesday November 13) to participate. Operation Christmas Child shoeboxes are available in the lobby and are due back no later than Sunday, November 18. Please contact Heather Hada if you have any questions. Children's Ministry Opportunity - Our Sunday morning ministry to children is growing! If you are interested in serving children of any age as a coordinator, teacher, or assistant, please talk with Pastor Travis. There will be a Celebration of Life for June Soderquist on November 15, 2018 at 7 p.m. at Tanner Spring Assisted Living (23000 Horizon Drive, West Linn). Parking is limited to: Tanner Spring Assisted Living parking lots, Day Street, and Safeway. Do not park in the front roundabout. It is used by the First Responders. The Rick Sollers Memorial Blood Drive will take place at the West Linn Campus on Saturday, November 24 from 9:30 a.m. to 3 p.m. To schedule your appointment contact the Red Cross (1-800-RED-CROSS), or visit www.redcrossblood.org; sponsor code: RickSollers.